After the completion of the preliminary investigation, the court date for the 35 migrants that are being accused of having participated in the revolt that took place in the Moria detention centre on July 18 in 2017, has been set for April 20 in the Mixed Jury Court of Chios. Since months, refugees have been organizing for their rights due to the large delays in the processing of their asylum applications and due to the wretched conditions under which they are forced to live in the Moria detention centre. On July 17, a group of migrants, mainly of African origin, had announced that they would go on repeated protests. An additional reason for the protests are the wretched conditions they have to endure in the detention centre of Moria. 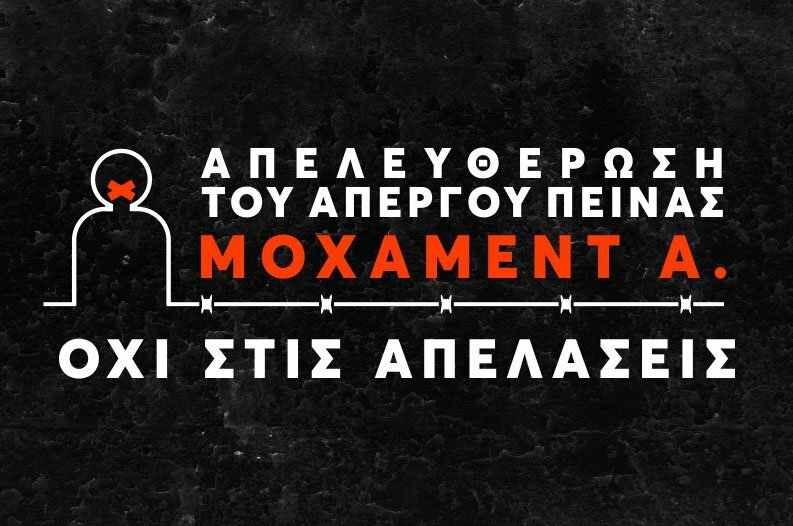 The announced protest is the climactic result of various smaller and more impulsive protests, which took place in the detention centre as well as in the town of Mytilene. During that time, several of the migrants, who were organising to resist the state’s repressive policies, had been threatened by the police that they would soon find out “who the boss in the detention centre is”, whereupon NGO workers urged them to quit the protests. On Tuesday, July 18, during a sit-in protest outside the European Asylum Support Offices (EASO) that lead its employees to leave their offices, the authorities pointed out that the protesting migrants are themselves to blame for the delayed processing of the asylum applications, causing another group of migrants to turn against them. Subsequently, the protesting migrants left the camp to block the main street outside. While shouting slogans outside the camp, police forces from inside as well as outside the detention centre attacked them with stones, teargas and stun grenades.The migrants responded by throwing rocks back at the police and starting small fires. After the conflict, the interior of the detention centre had returned to “normality”, yet police forces started a purge inside Moria. The migrants had to face the menace of the riot police, who stormed house-containers, beating anyone indiscriminately until finally arresting 35 people at random. Their sole criterion was skin colour, since they were targeting people of African descent. The arrestees were brought to the Central Police Department of Lesvos, where they were held without any medical help despite having suffered severe beatings. Only one of the arrestees was taken with an ambulance to the hospital directly from the detention centre, due to loss of consciousness, after having suffered a murderous strike at his nape. During the following month, rumours about complementary arrests were going round, terrorising the entrapped migrants even more, which lead many of them to leave their tents and containers for fear of being targeted. The insecure situation created an atmosphere of powerlessness, passivity and a feeling of defeatism. Arson by intent from which a hazard may arise for a person, jointly. Dangerous physical harm, attempted as well as executed to the detriment of police and fire brigade officers, jointly and repeatedly. Damage in form of arson of foreign ownership and of an object that serves a common benefit, jointly and repeatedly. Resistance performed by more than one person, who had their faces covered and carried potentially dangerous objects. The court ordered a pre-trial detention for 30 of the accused, while the remaining five (the seriously injured and four other migrants, who had not been provided with an interpreter for the period of a month and a half) saw restrictive orders of residence on the island and had to make an appearance at the police department twice a month. Out of the 30 detainees, 10 are in prison on Chios Island, 13 in Korydallos (Athens), six in the juvenile detention facilities in Avlona (Attica) and one was transferred from Avlona to Malandrino prison (Central Greece). Serious issues resulted from their separation, since they were imprisoned far away from their lawyers and friends, greatly aggravating their isolation and uncertainty, while posing significant obstacles to their preparation for the upcoming trial. This practice has been applied to political prisoners in the past, for instance in a similar case concerning eight persecuted migrants from Petrou Ralli. Initially, their defence had been assumed by lawyers active in NGOs on the island and as the case started to trigger public attention, more NGOs appeared willing to adopt some of the court cases. 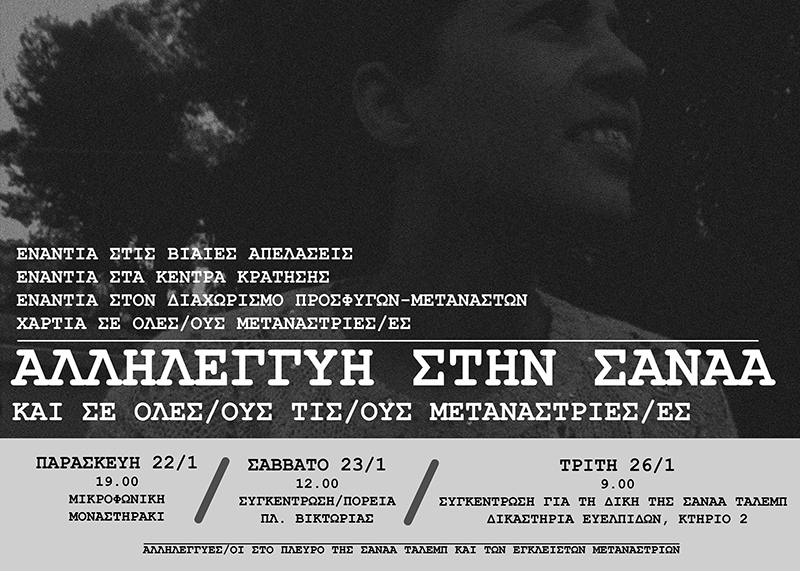 However, only days before the trial date was set, the NGOs Solidarity Now, Metadrasi and Synyparxis Lesbos announced their withdrawal from the process. Accordingly, the already problematic situation was severely aggravated, since the defendants had to find new lawyers. As a result, nine of the migrants on trial will be represented by lawyers from solidarity groups. The role judicial authorities play in counter-insurgency practices becomes clear in the location of the chosen court. 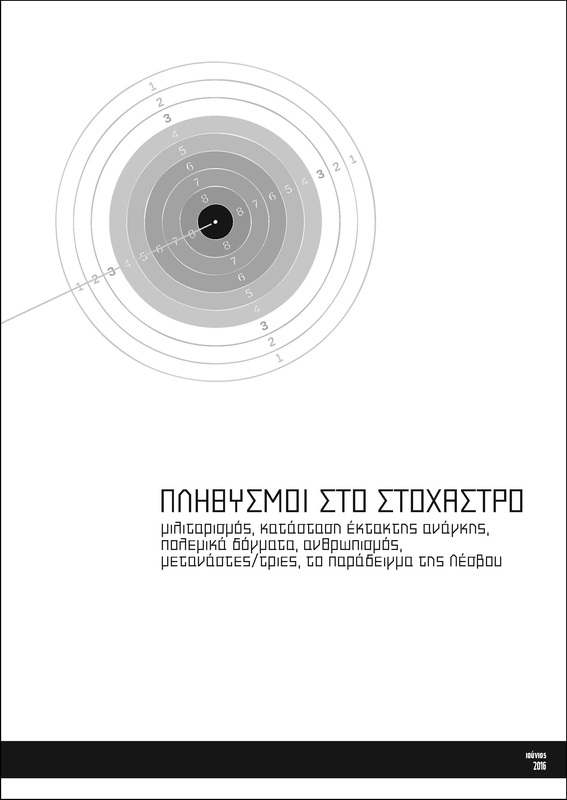 The transfer of the trial to Chios stands in contradiction with the court’s own decision of imposing restriction orders on five defendants. Despite the judges being aware of the defendants’ precarious financial situation, the trial will take place on Chios and is expected to last for several days, which creates enormous costs of residence in addition to travel expenses. Furthermore, the location of the trial creates serious limitations to the presence of witnesses in their defence. As the events took part in the detention center of Moria, many of the eyewitnesses are migrants put under administrative restrictions, who do not have the option to leave Lesvos. The same can be said for many local witnesses. Due to limited transport between the two islands, day-to-day presence is rendered impossible, wherefore witnesses would have to put their jobs on hold for an indefinite period of time and at whatever cost. The removal of essential testimonies resulting from the choice of location serves as a convenient pretext for the vengeful and premeditated attitude of the judiciary authorities towards the persecuted migrants. While global geopolitical contestations continue, showing no sign of decrease, economic expansionism flourishes and various authoritarian and fundamentalist regimes keep appearing in every corner of the world, Fortress Europe intensifies its military-police management of the migration flow. Perhaps better organised than ever, the decision for the creation of spaces of exception at the European borders takes shape; spaces where all those who have not lost their lives during their passages, will be detained and suffer severe devaluation and violence. By means of a system of continuous human degradation, migrants will be categorised as “wanted” or “unwanted”. Those wanted will serve as the necessary new labor force of Europe, while at the same time providing an alibi for the anti-migration death policies. The rest will inevitably be criminalised, since their only feasible option is to travel further without documents, whereupon they will be exploited as cheap labor forces, which is fundamental to the reproduction of power structures manifested in local and global capital. Their only other option is deportation to their countries of origin or to third countries. Additionally, migrant populations have become the new “internal enemy”. The media aid in the construction of a reality under threat so as to justify the existence of totalitarianism as “socially necessary”. Migrants are portrayed as biologically and culturally inferior or as contagious disease carriers, while being placed in camps lacking sanitary facilities. 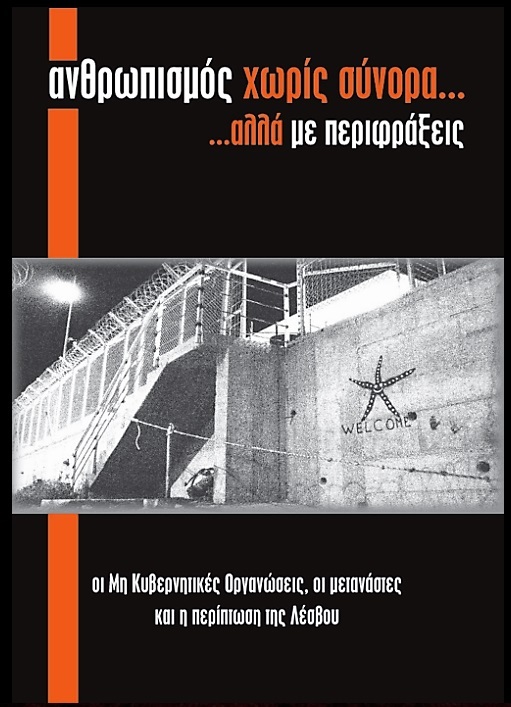 The use of a militaristic rhetoric aids in migrants being represented as invaders, justifying Greek and European army forces taking position at the borders but also expanding their operations in the interior of Fortress Europe. A “state of emergency” is being introduced in an increasing number of areas in Europe. A doctrine that comes out of, while simultaneously evoking the necessary national cohesion and consensus needed for a continuation of intensified policies of devaluation of the “bottom” of society. Nevertheless, “war against migrants” means money. The industry that developed due to the governance of migration populations should not be overlooked. Capital continues to be reproduced either through military equipment serving the protection and surveillance of the borders or through human capital, as a consequence of the widespread doctrine of military humanitarianism. Given the context, Lesvos was chosen, for the second time in its recent history, as the main area for the application of the anti-migration border policies at the beginning of the so-called “Eastern Mediterranean Route”. As a result, new military-police forces and different types of detention centres have emerged in addition to the encouragement of a crucial social detachment in order to generate consent for the death-politics that are unfolding. Policies that led to dozens of dead people being washed ashore plus the deaths of 14 people inside the detention centres. Totalitarianism casts a cloud over life on the island with few cracks opened up by the resistance of the migrants, but also by parts of a widespread, international counter-movement, which has shown numerous and continuous actions. These moments of resistance that provide short-lived autonomy, cause migrants being subjected to even more terror and violence in order to isolate them from the ones who stand by them in solidarity. The decision to stand by the 35 persecuted migrants has nothing to do with any innocence criterion, nor does it signify an one-dimensional anti-racist struggle. Their persecution can only be understood as yet another side of the counter-insurgent policies that have been established by previous governments and are now put into practice by the leftist government SYRIZA. The evident decline of social and class movements in recent times allows for attacks on those at the bottom to assume a more permanent and final character. A plethora of oppressive tools, of a policing, judicial, administrative and economic nature, are being used against those who choose continuous and unmediated resistance. The ever-increasing militarisation of police forces. Creation of spaces of exception, like the migrant concentration camps. The new reformation of the correctional code and the attacks against resisting prisoners. Use of fines as blackmail, as in the case of total army objectors. The adoption of explicit criminal offences for those resisting residence auctioning. Criminal persecution of unionist struggles. Environmental degradation and persecution of those resisting it. All these are aspects of the same state-capitalist attack against those at the bottom. Attacks that go beyond traditional borders of nation-states. Through the reformulation of legal frameworks, the attempt of transnational cooperation in order to curb resistances, is becoming more and more intense. The establishment of European military and police security forces, transnational judicial cooperation, and the development of common European policies on population management constitute the new reality. But answers will be given at all levels. Against the nationalism of any nation, the state barbarity of any state, the exploitation of capital, the resisting parts of society develop their own struggles (i.e. 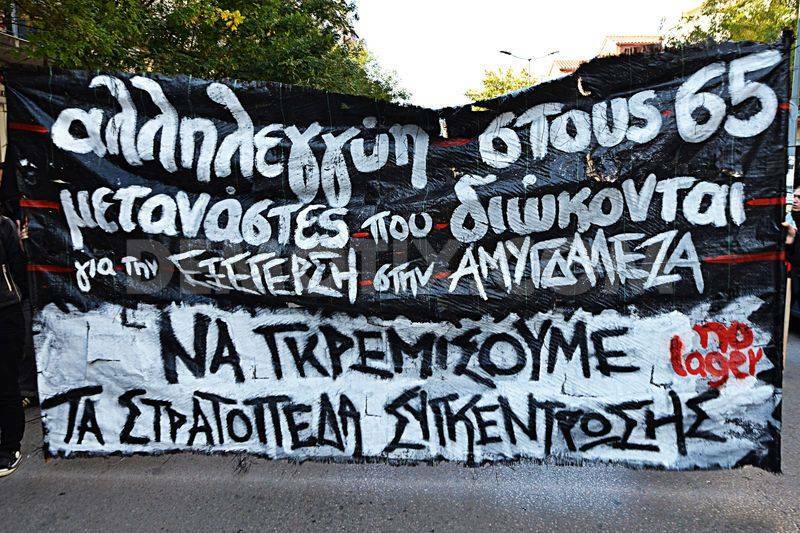 Hamburg G20, Thessaloniki’s Balkan Antinational Demo, No Border Movement). Struggles beyond borders, states, nations, and nationalisms. The trial of the 35 migrants can only be viewed as a trial against all of society that resist the continued devaluation and repression of their lives. This trial aims to be carried out in a black hole of space and time, limiting any opportunity for solidarity. For this reason, more urgently than ever, highlighting yet another instance of state arbitrariness directed towards one of the most oppressed social groups, is essential. We call upon individuals, groups and organisations to stand in solidarity and organise initiatives. 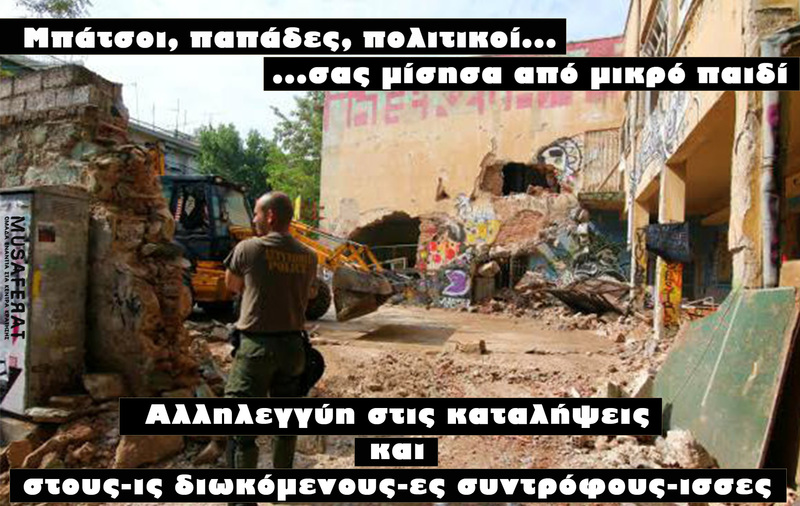 To work against the decision of the judicial authorities to try and erase the trial by transferring it to Chios, comrades throughout Greece and beyond need to bring the issue to attention. 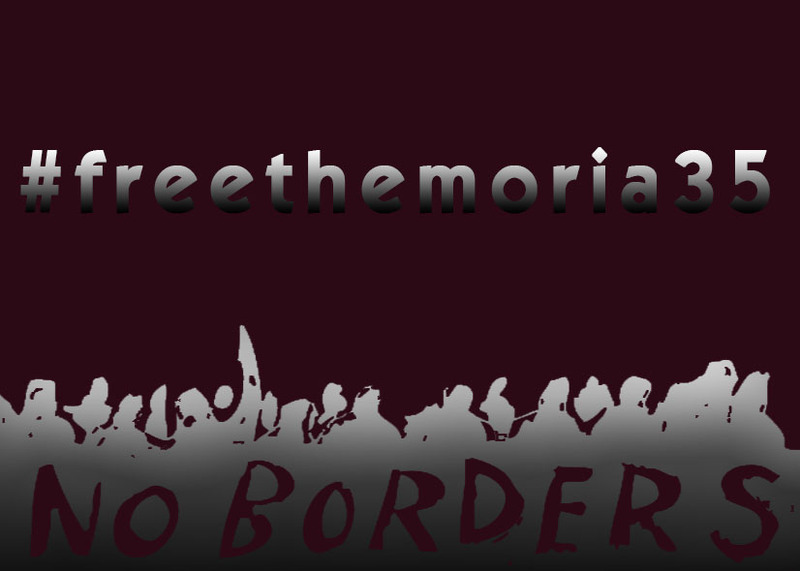 The twitter account @freethemoria35 and #freethemoria35 has been set up for the purposes of the solidarity campaign, while the self-organised media will be used for more precise information and updates.